There was a bit of a chill in the air on Saturday morning, but it soon disappeared once the 232 runners were off and running. 13 of you were brand new to parkrun - welcome! Tourists last weekend represented Warrington, Victor Harbor (Australia), Oakwell Hall, Newent, Lloyd, South Manchester and Cuerden Valley parkruns. Also running were parkrun uber tourists John and Joanna Cassells - they have run 233 times and visited a whopping 178 different events! I remembered after the run that I've run with them before at Penrith and Keswick. They have distinctive tshirts which when they are stood together say 'We love parkrun'. Have a look at our future roster page and please get in touch if you'd like to help out one Saturday. 56 of you recorded a new PB on Saturday. Congratulations to all of you including Jack Rylands, Mary Messenger, Deborah Hull and juniors Amelie Marshall, Hannah Latimer and Callum Pattinson. Well done all! 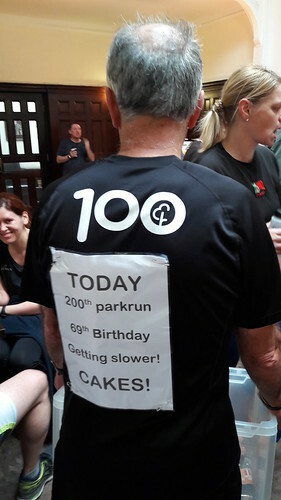 There's also a special mention to Steve Viney who combined his 69th birthday with his 200th parkrun. Well done Steve and thanks for the post-run cakes. James BUIS (VM35-39) of Border Harriers & AC, was first over the line in 16:40. Paul M GRAVES (VM35-39) of DH Runners, was second over the line in 16:46. John PATTINSON (VM35-39) of University of Cumbria Road Runners, was third over the line in 18:28. Emma MCKNESPIEY (VW40-44) of Border Harriers & AC, was first (27th overall) over the line in 21:33. Emma WRIGHT (JW15-17) of Carlisle Aspatria AC, was second (28th overall) over the line in 21:36. Susan FAWKES (SW25-29) of DH Runners, was third (33rd overall) over the line in 22:25. Today's full results and a complete event history can be found on the Carlisle parkrun Results Page". Enjoy the rest of your week and fingers crossed for weather like this on Saturday! It’s beginning to look alot like Christmas………. Christmas and New Year are the time when we can hold extra events - so they all count in your club progression! 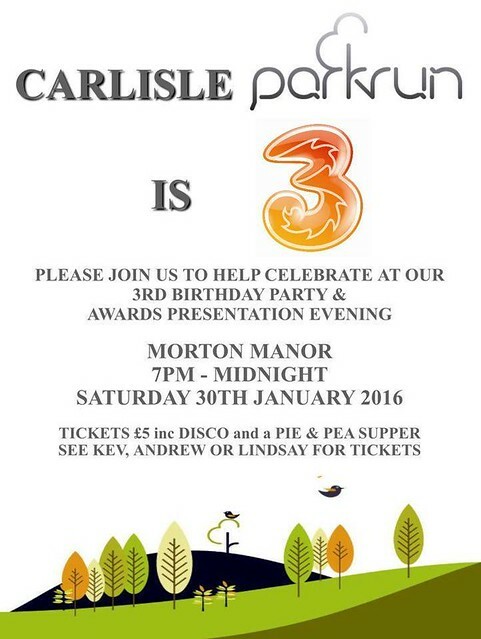 And what's better than the chance to parkrun 4 times in 10 days! If you're going to be away over the Christmas period, you can check the CHRISTMAS COMPENDIUM to see if there will be a parkrun near you holding their own Christmas and New Year runs. Manorfest is taking place in Chances Park on June 28th, therefore there will be no parkrun that morning. A perfect chance to partake in some tourism!